Attention Bridge Skaters! The Winter 2019 Bridge Contract is now available. Be sure to contact your skater’s coach to verify the night of your private lesson for this next session. Please note, contracts and payments are expected to be handed in on or before the first night of the session. All Bridge Skaters in this session will have the opportunity to perform in special group numbers during MPFSC’s annual ice show on Sunday, February 24th. More details will be provided in January. All Bridge registrants will be required to bay a $5 show participation fee. We are happy to announce that online registration is now available for Bridge Skaters. Click the link below to fill out your Learn to Skate and Bridge paperwork online! If you prefer you may print a PDF copy of your Bridge paperwork from the link below. If your skater is taking Learn to Skate Lessons as well this session, you can print off a copy of that form here. (All Skaters in the Bridge Program can continue to take LTS group lessons for 1/2 off each night). Skating Families taking part in the Bridge program are required to complete 8 hours of volunteer time by May 23rd of each year. Bridge Families who do not meet this requirement will be billed $10 per hour not completed. More details and a listing of volunteer opportunities can be found here. 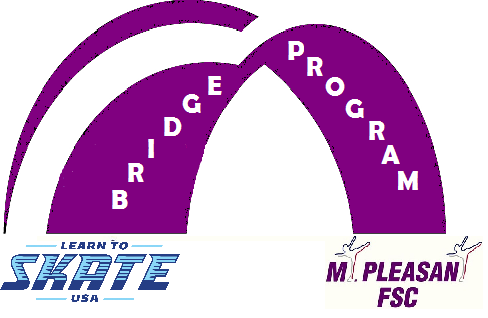 The Bridge Program is designed to slowly transition skaters from Learn to Skate USA group classes into full membership in the Mt. Pleasant Figure Skating Club. The program offers semi-private and private lessons, allowing the skater to utilize the whole ice surface while receiving more individualized instruction to improve their skills, learn to perform programs to music, and/or prepare for Basic Skills competitions. Click here to learn more! *Please note that openings in the Bridge Program are based on coaching availability.